Submitted by Hot Wheels on Sun, 05/09/2004 - 11:42. Short answer is NO! 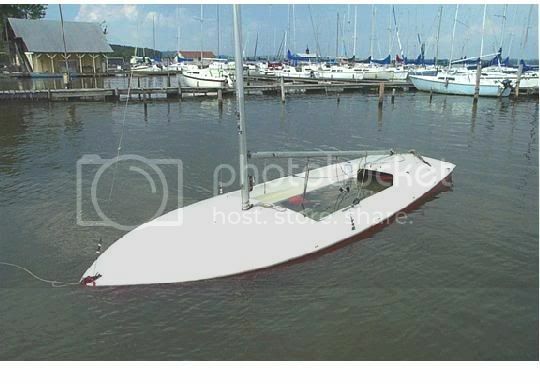 Aside from the strengtrh issue, There are other issues...such as unless you have an inflated bow bag to raise the bow, a Scot will submarine when swamped if pulled by the bow eye, because of all the flotation aft under the seats and the weight if the wet rig and sails pushing the bow under. There is a bridle system recommended to tow a swamped Scot, which allows the bow to rise as the water inside runs aft, hopefully out the open inspection port[s] you have installed in the transom. This bridle is shown in Scot literature and may also be on this website somewhere. Most racing dinghies should be towed by the mast as it is the strongest fixture on the deck. But I would NOT tow a swamped Scot under a heavy load with anything but the recommended bridle, properly secured. Submitted by glbennett on Sun, 05/09/2004 - 22:17. Submitted by Bruce177 on Sun, 05/09/2004 - 23:32. Ok, thanks to both. I'll look into the bridle setup. I had not invisioned she could submarine w/o the bow bag installed. I'll need to look into that also. I learn something new every time I enter this site. Submitted by glbennett on Tue, 05/11/2004 - 19:01. Submitted by Bill Harshman on Mon, 07/23/2018 - 20:58. On the Flying Scot Inc. website, go to the 'How-To Guide' tab at the top of the Home page. Click on the tab and scroll down to the 'Rescue Bridle' in the second column and click on it. You will find detailed instructions for how to make a rescue bridle and how attach it to your boat and some instructions on how to tow a swamped Scot. I made my own bridle using 5/8s single braid and brummel splicesand otherwise following these instructions. It is not hard to do and is a good winter Sunday afternoon project.